Americans celebrated into the night after their national football or ''soccer'' team as the case may be defeated Ghana 2-1. Now, USA is not particularly renowned for its love of "soccer" but football fans across the country celebrated a last-gasp win against the team's World Cup nemesis, Ghana. Defender, John Brooks headed in a late winner for USA in a dramatic finale to their opening Group G game in Natal. And trust American Supporters. They partied well into the night. "It's like a Who concert and a Beatles concert combined," celebrant James Cannon told the New York Post as fans streamed into the streets of Manhattan following the victory. Fan Julianne Naso was one of hundreds gathered at a New York sports bar to watch the game. "People erupted after that first goal," she told the newspaper. "We have some momentum now. Hopefully, we keep it going." 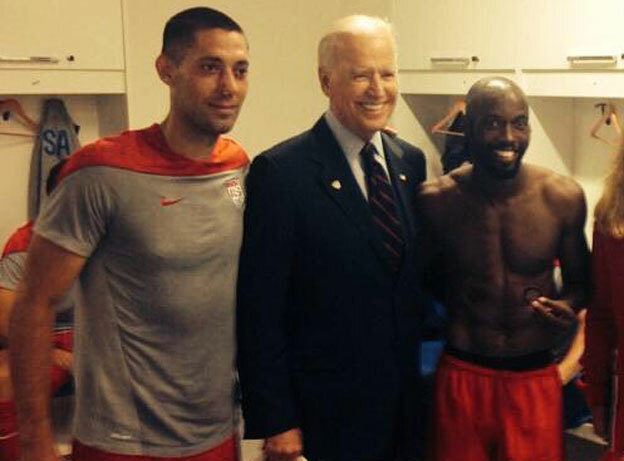 Even Vice President Joe Biden was not left out as he joined the players in the dressing room to celebrate. 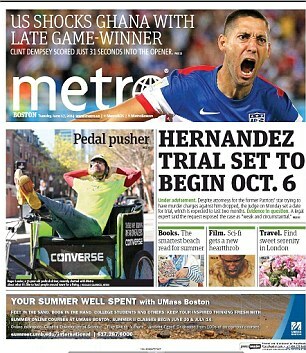 The newspapers and tabloid too had a field day. It's not often that football can dominate the sport headlines in the United States, but it's even rarer for it to take over the front pages. For a country that is often more fixated on basketball and American football, it was 'soccer' that captured the nation - and USA's thrilling opening game World Cup victory over Ghana on Monday. 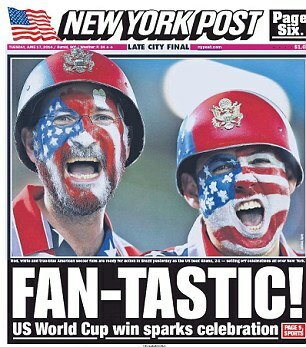 The New York Post dedicated their whole front page to the Group G victory, showing two fans who watched the action in Brazil and claiming how the win sparked celebration. 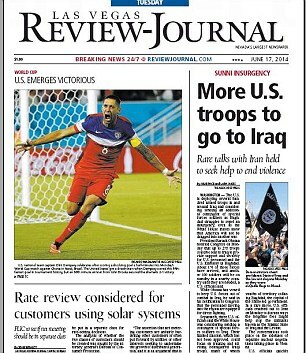 Clint Dempsey's first minute opener was the lead picture in the Boston Metro, who revelled on US pouncing late on to steal three points, and the former Fulham and Tottenham forward's opener also made the front page of the Las Vegas Review-Journal. It was John Brooks who scored the winner and the celebrations after his header four minutes from time helped lead the front page on the Washington Times and USA Today. USA's win over Ghana gives them real hope of progressing from Group G, with their match against Portugal on Sunday holding the key as to whether they can book an unlikely spot in the last 16 over Cristiano Ronaldo and Co.